IEEE Senior Member; Member of IEEE Computational Intelligence Society. Associate Editor, the journal of IEEE Transactions on Evolutionary Computation. Associate Editor, the journal of Swarm Intelligence (Springer). Associate Editor, the International Journal of Swarm Intelligence Research (IJSIR). Member, Task Force on Swarm Intelligence, IEEE Computational Intelligence Society (Vice Chair, 2012 - 2016). Vice Chair, Task Force on Multi-modal Optimization, IEEE Computational Intelligence Society (from 2015). Member, Task Force on Evolutionary Computation in Dynamic and Uncertain Environments (ECiDUE), IEEE Computational Intelligence Society. Member of the editorial board of the journal of Softcomputing (Springer). Member, Intelligent Systems Applications Technical Committee (ISATC), IEEE Computational Intelligence Society. Member, Steering committee of Simulated Evolution And Learning (SEAL). Member, Advisory Board of the Center of Computational Science. Scientific Advisor, Scientific Advisory Board, Complexica. Complexica is a leading provider of Artificial Intelligence software for optimising sales & marketing activities, ranging from promotional planning, pricing, and product mix optimisation, through to sales force automation, CRM, and multi-channel quoting and order processing. Technical Chair, The IEEE Congress on Evolutionary Computation (CEC'2018), part of WCCI'2018, Rio de janeiro, Brazil, July 8 - 13, 2018. Program Chair, The 31st Australasian Joint Conference on Artificial Intelligence (AI'2018), 4-7 December 2018, Wellington, New Zealand. Organizer, The 3nd International Workshop on "Advances in Multimodal Optimization",	September 8 - 12, 2018, Coimbra, Portugal. Organizer, GECCO 2018 Competition on Niching Methods for Multimodal Optimization, July 15 - 19, 2018, Kyoto, Japan. Technical Committee Co-Chair, The Ninth International Conference on Swarm Intelligence (ICSI 2018), June 17 - 22, 2018, Shanghai, China. Member, Senior Program Committee, the 33nd AAAI Conference on Artificial Intelligence (AAAI-19), January 27 - February 1, 2019, Honolulu, Hawaii, USA. Competitions Chair, the 10th Edition of International Conference Series on Evolutionary Multi- Criterion Optimization (EMO 2019), March 10 - 13, 2019, East Lansing, Michigan, USA. Organizer, GECCO 2019 Competition on Niching Methods for Multimodal Optimization, July 13-17, 2019, Prague, Czech Republic. Co-chair of the track on Ant Colony Optimization and Swarm Intelligence, The Genetic and Evolutionary Computation Conference (GECCO 2017), July 15-19, 2017, Berlin, Germany. General Chair, The Australasian Conference on Artificial Life and Computational Intelligence (ACALCI 2017), Melbourne, Australia. General Chair, The 30th Australasian Joint Conference on Artificial Intelligence (AI'17), Melbourne, Australia. Technical Committee Co-Chair, The Eighth International Conference on Swarm Intelligence (ICSI 2017), Fukuoka, Japan, July 27 - August 1, 2017. Technical Committee Co-Chair, The International Conference on Simulated Evolution And Learning (SEAL'2017), Shenzhen, China, 2017. Organizer, 2017 IEEE CEC Special session/competition on Niching Methods for Multimodal Optimization, June 5-8, 2017, Donostia - San Sebastian, Spain. Co-chair of the track on Ant Colony Optimization and Swarm Intelligence, The Genetic and Evolutionary Computation Conference (GECCO 2016), July 20-24, 2016, Denver, Colorado, USA. Organizer, GECCO 2016 Competition on Niching Methods for Multimodal Optimization, July 20-24, 2016, Denver, Colorado, USA. Program Co-chair, The Australasian Conference on Artificial Life and Computational Intelligence (ACALCI 2016), February 2-5, 2016, Canberra, Australia. Technical Program Chair, The Tenth International Conference on Swarm Intelligence (ANTS 2016), September 7-9, 2016, Brussels, Belgium. Organizer, 2016 IEEE CEC Special session/competition on Niching Methods for Multimodal Optimization, July 25-29, 2016, Vancouver, Canada. Former Chair (from 2012 - 2016), Task Force on Large Scale Global Optimization, IEEE Computational Intelligence Society. Vice Chair, Computational Intelligence Society Chapter, IEEE Victorian Section, Melbourne, Australia (2012 - 2016). Organizing chair, 2015 IEEE CEC Special Session on Niching Methods for Multimodal Optimization, May 25-28, 2015, Sendai, Japan. Organizing chair, 2015 IEEE CEC Competition on Niching Methods for Multimodal Optimization, May 25-28, 2015, Sendai, Japan. Organizer, 2015 IEEE CEC Special Session on Large Scale Global Optimization, May 25-28, 2015, Sendai, Japan. Organizing chair, 2015 IEEE CEC Competition on Large Scale Global Optimization, May 25-28, 2015, Sendai, Japan. Technical Committee Co-Chair, Sixth International Conference on Swarm Intelligence and the Second BRICS Congress on Computational Intelligence (ICSI-CCI'2015), June 26 - 29, 2015, Beijing, China. Publication Chair, 2015 IEEE Symposium Series on Computational Intelligence (SSCI 2015), December 7-10, 2015, Cape town, South Africa. Organizer, 2014 International Workshop on Advances in Multimodal Optimization, 13 - 17 September 2014, Ljubljana, Slovenia. Technical Committee Co-Chair, International Conference on Swarm Intelligence (ICSI'2014), 17 - 20 October 2014, Hefei, China. Technical Co-Chair, Tenth International Conference on Simulated Evolution And Learning (SEAL 2014), 15-18 December 2014, Dunedin, New Zealand. Panel member for "Big Data and Computational Intelligence Panel" in the upcoming WCCI 2014. Organizing chair, 2014 IEEE CEC Special Session on Niching Methods for Multimodal Optimization, 6 - 11 July 2014, Beijing, China. Organizing chair, 2014 IEEE CEC Special Session on Large Scale Global Optimization, 6 - 11 July 2014, Beijing, China. Organizing chair, 2013 IEEE CEC Special Session on Niching Methods for Multimodal Optimization, 20 - 23 June 2013, Cancun, Mexico. Organizing chair, 2013 IEEE CEC Special Session on Large Scale Global Optimization, 20 - 23 June 2013, Cancun, Mexico. Program Chair, IEEE Congress on Evolutionary Computation 2012 (CEC 2012), part of 2012 IEEE World Congress on Computational Intelligence (WCCI 2012), 10 - 15 June 2012. Special session chair, Third International Conference on Swarm Intelligence (ICSI'2012), Shenzhen, China, 17 - 20 June 2012. Publicity chair, Second International Conference on Swarm Intelligence (ICSI'2011), Chongqing, China, 12 - 15 June 2011. Technical Committee Chair, International Conference on Swarm Intelligence (ICSI'2010), 6 - 9 June 2010. Publicity Co-Chair, Seventh International Conference on Swarm Intelligence (ANTS 2010), 8 - 10 September 2010. Organizing chair, 2010 IEEE CEC Special Session on Niching Methods for Multimodal Optimization, 18 - 23 July 2010, Barcelona, Spain. Organizing chair, First Australasian Computational Intelligence Summer School (ACISS'09), 30 November - 1 December, 2009. 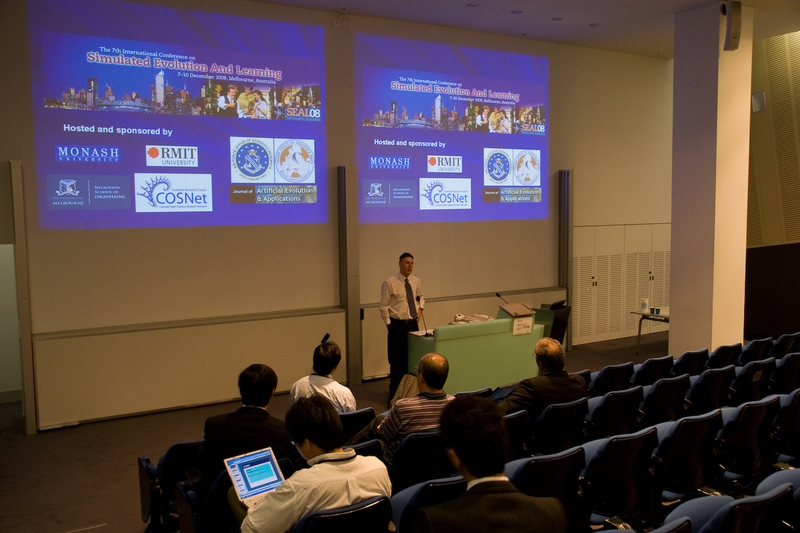 Program Co-chair, 22nd Australasian Joint Conference on Artificial Intelligence (AI'09), 1 - 4 December 2009. Visiting research fellow at CERCIA, University of Birmingham (12 July - 19 September 2008; 13 - 22 May 2009; 28 August - 11 September 2009), funded by an EPSRC grant. General Chair, Seventh International Conference on Simulated Evolution And Learning (SEAL'08), 7 - 10 December 2008. Publicity chair and steering committee member, IEEE Swarm Intelligence Symposium 2007 (SIS2007), Honolulu, Hawaii, USA, 1 - 5 April, 2007. Organizing chair, Special session on Swarm Intelligence, CEC'06. Tutorial and special sessions chair, Sixth International Conference on Evolution And Learning (SEAL'06), Hefei, China, 15 - 18 October, 2006. Organizing chair, Special session on Swarm Intelligence, CEC 2004. Organizing chair, Special session on Swarm Intelligence and Its Applications, CEC 2003. Member, editorial board for International Journal of Computational Intelligence (IJCI). Guest editor, Special Issue of Information Sciences Journal (ISJ) on "Nature-Inspired Algorithms for Large Scale Global Optimization", September 2015. Guest editor, special issue on Evolutionary Optimization and Learning, Journal of Soft Computing (to appear). Guest editor, special issue on Evolutionary Optimization, Journal of Computer Science Technology, Vol.23, No.1, January 2008. PhD thesis, Department of Information Science, University of Otago, New Zealand, 2004. PhD thesis, Department of Computer Science, University of Pretoria, South Africa, 2005. PhD thesis, Department of Information Science, University of Otago, New Zealand, 2007. PhD thesis, Department of Mechanical Engineering, The University of Melbourne, Australia, 2009. PhD thesis, School of Aerospace, Civil and Mechanical Engineering, University of New South Wales, Australia, 2009. PhD thesis, School of Engineering and Information Technology, University College, University of New South Wales, Australian Defence Force Academy, Australia, 2009. PhD thesis, Department of Computer Science, University of Pretoria, South Africa, 2009. PhD thesis, School of Information Technology and Electrical Engineering, University of Queensland, Australia, 2011. PhD thesis, Department of Statistics, Macquarie University, Australia, 2012. PhD thesis, School of Computer Engineering, Nanyang Technological University, 2013. PhD thesis, School of Computer Science, University of Adelaide, 2013. PhD thesis, Faculty of ICT, Swinburne University of Technology, 2013. PhD thesis, School of Science, Information Technology and Engineering, Faculty of Science, Federation University Australia, 2014. PhD thesis, School of Computer Science, The University of Adelaide, 2018. Invited lectures on "Swarm Intelligence", Workshop on Swarm Intelligence, SUSTech, Shenzhen, China, 24 March 2018. Invited lectures on "Evolutionary Methods", The 6th International Optimisation Summer School, Kioloa, NSW, Australia, 14 - 19 January 2018. Tutorial on "Evolutionary Large-Scale Global Optimization: An Introduction", IEEE CEC'2017, GECCO'2017, SEAL'2017. Invited keynote talk, "Seeking multiple solutions: multi-modal optimisation using niching methods", SEAL'2017 (11 November 2017); also invited talk at AMSIOptimise’17 (27 June 2017). Tutorial on "Recent Advances in Multi-modal Optimization using Niching Methods", IEEE CEC 2016, Vancouver, Canada, July 2016. Tutorial on "Decomposition and Cooperative Coevolution Techniques for Large Scale Global Optimization", Sun Yat-sen University, Xidian University, Xi'an Jiaotong University, Guangdong University of Technology, China, April 2015. Tutorial on "Swarm Intelligence", Xidian University, South China University of Technology, China, April 2015. Tutorial on "Decomposition and Cooperative Coevolution Techniques for Large Scale Global Optimization" at WCCI'2014 and GECCO'2014. I was on a short media interview by "theAge" Fairfax Science Columnist Peter Spink on "Has the Turing Test really been passed? ", 10 July 2014. Tutorial speaker, on "Decomposition via Cooperative Coevolution for Large Scale Global Optimization", 2013 IEEE CEC, 20 - 23 June 2013, Cancun, Mexico. Invited talk on "Introduction to Particle Swarm Optimization ", Victorian University of Wellington, New Zealand, 4 May 2012. Invited lecturer, an IEEE & ITEE Evening Lecture on "Swarm Intelligence", Melbourne, Australia, 6:30 - 7:30pm, 5 September 2012. Invited lecturer, "Decomposition via Cooperative Coevolution for Large Scale Global Optimization ", Xidian University, Xi'an, China, 28 and 30 October 2012. Invited lecturer, two talks on "Swarm Intelligence" and "Decomposition via Cooperative Coevolution for Large Scale Global Optimization ", 2012 International Workshop on Nature Inspired Computation and Applications (IWNICA'12), Hefei, China, 22 - 25 October 2012. Invited lecturer, "Advances in Particle Swarm Optimization", Sun Yat-sen University Computational Intelligence Winter School 2011, Guangzhou, China, 24 - 28 January 2011. A seminar talk on "Particle Swarm Optimization ", School of Mathematical and Geospatial Sciences, RMIT University, 28 May 2010. A seminar on "Recent developments on Particle Swarm Optimization ", University of Science and Technology of China (USTC), China, 24 September 2008. A tutorial on "Particle Swarm Optimization", with Prof. Andries P. Engelbrecht, GECCO'07, London, UK, 7 - 11 July 2007. A tutorial on "Particle Swarm Optimization ", SEAL'06, Hefei, China, 15 - 18 October 2006. A seminar talk on "Multiobjective Optimization using Particle Swarms", Monash University, Melbourne, 2005. 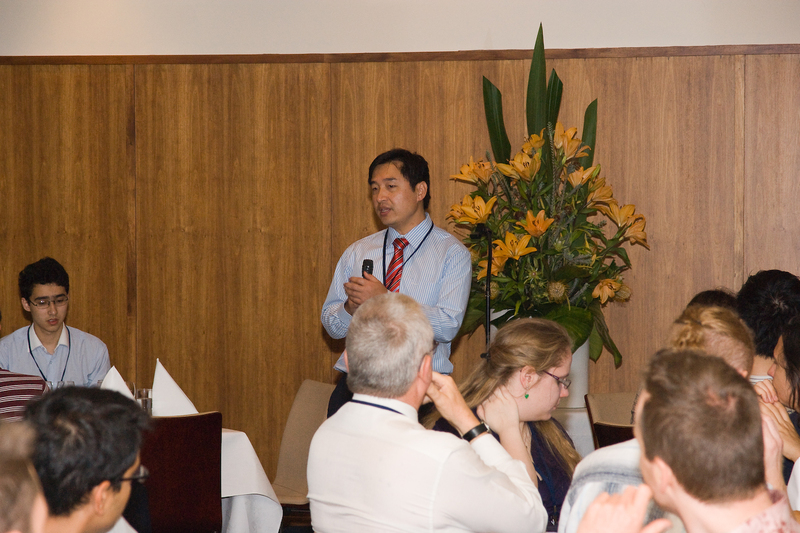 I was giving a short speech during the SEAL'08 conference dinner (to thank everyone making the conference a success). The dean of Engineering of the Melbourne University giving an opening speech at SEAL'08 (Mengjie Zhang, Michael Kirley, and I were sitting at the front rows).